Since these small town streets are in my own home town, I may be a bit biased, but for me this is classic America. When I think of small towns, streets like this lined with old shops and period architecture are what come to mind. And Cherry Street in downtown Montezuma is a listed US Historic district. 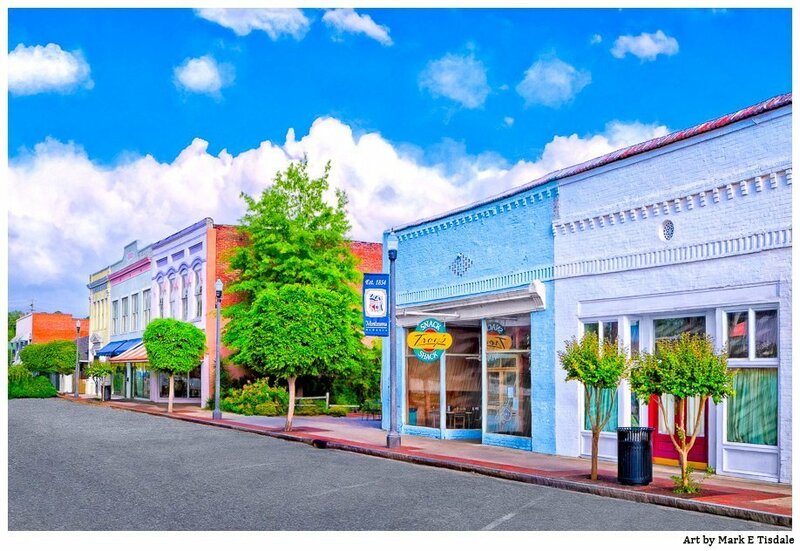 The stores and shop fronts you see here are mostly examples of Italianate Commercial style architecture that flourished on small town streets until the late 19th century. It was at this period of time that Montezuma was at its peak. Cotton and peaches were major crops in the area and small mills and factories were opening their doors. And Montezuma’s commercial district came to be look architecturally much as we see it today. And one of our oldest local businesses faces this small town street. It’s Troy’s Snack Shack which has been a local burger joint for generations in Montezuma. In fact, it’s one of those types of greasy spoons that has such a loyal following that home town folks who visit don’t miss their chance at a meal there. Many even take some home with them. In my childhood this small town street had an unusual distinction. It was the only street in town that had railroad tracks going straight down the middle of it. When freight trains passed through, people parked on the street had to wait to leave. Maybe it’s no big surprise that the railroad was such a central part of our downtown. Montezuma grew up around this spot on the map because it was where two separate railroads crossed the Flint River. In the 1980’s there was a small derailment that eventually led to moving these tracks. But for some of us, Cherry Street will always be where we watched trains stop for the engineers to get food from Troy’s. Do these small town streets appeal to you because of the strong sense of Americana? Or do you have Montezuma connections? I hope you’ll pause for a bit to share what makes this Georgia print special to you!